^ F.E. Turneaure; and H.L. Russell (1901). Public Water-Supplies: Requirements, Resources, and the Construction of Works (1st ed.). New York: John Wiley & Sons. p. 493. ^ “Typhoid Epidemic at Maidstone”. Journal of the Sanitary Institute 18: 388. (October 1897). ^ Reece, R.J. (1907). "Report on the Epidemic of Enteric Fever in the City of Lincoln, 1904-5." In Thirty-Fifth Annual Report of the Local Government Board, 1905-6: Supplement Containing the Report of the Medical Officer for 1905-6. London: Local Government Board. ^ Fuller, George W. (1909). "Description of the Process and Plant of the Jersey City Water Supply Company for the Sterilization of the Water of the Boonton Reservoir." Proceedings AWWA. pp. 110-34. ^ Hazen, Allen. (1916). Clean Water and How to Get It. New York: Wiley. p. 102. ^ V. B. Nesfield (1902). “A Chemical Method of Sterilizing Water Without Affecting Potability”. Public Health: 601–3. http://www.publichealthjrnl.com/article/S0033-3506%2802%2980142-1/abstract. ^ Darnall CR (November 1911). 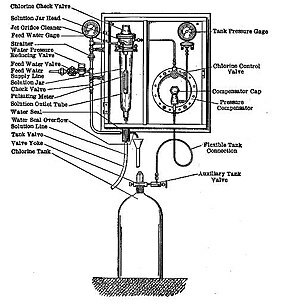 “The purification of water by anhydrous chlorine”. Am J Public Health 1 (11): 783–97. doi:10.2105/ajph.1.11.783. PMC: 2218881. PMID 19599675. https://www.ncbi.nlm.nih.gov/pmc/articles/PMC2218881/. ^ Hodges, L. (1977). Environmental Pollution (2nd ed.). New York: Rinehart and Winston. p. 189. ^ Baker, Moses N. (1981). The Quest for Pure Water: the History of Water Purification from the Earliest Records to the Twentieth Century. 2nd Edition. Vol. 1. Denver: American Water Works Association. p. 341-342. ^ Calderon, R. L. (2000). “The Epidemiology of Chemical Contaminants of Drinking Water”. Food and Chemical Toxicology 38 (1 Suppl): S13–S20. doi:10.1016/S0278-6915(99)00133-7. PMID 10717366. ^ Shunji Nakagawara, Takeshi Goto, Masayuki Nara, Youichi Ozaqa, Kunimoto Hotta and Yoji Arata (1998). “Spectroscopic Characterization and the pH Dependence of Bactericidal Activity of the Aqueous Chlorine Solution”. Analytical Sciences 14 (4): 691–698. doi:10.2116/analsci.14.691. ^ Guidelines for Drinking-water Quality. Volume 1, Recommendations (third edition incorporating the first and second addenda ed.). World Health Organization. (2008). p. 5. http://apps.who.int/iris/bitstream/10665/204411/1/9789241547611_eng.pdf.